To some extent, it seems that translation were a sort of transportation of something (apparently words) from one place to another. And this might be due to the fact that even the Latin word from which “translation” derives, “translatus”, comes from the verb trans-fero meaning “to bring on the opposite side of”. But even though it is true that translation has a spatial dimension, it also has a temporal and cultural one, all three made up of a number of other interrelated elements. That is why the ideal terms would be “prototext” (i.e. “first text”, the original text) and “metatext” (i.e. the subsequent text, deriving from the first one). 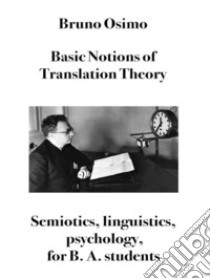 Such terms were coined by the Slovak semiotician Anton Popovic (1933-1984), who gave a substantial boost to translation studies in the 1960s and 1970s. Unfortunately, his ideas spread to the Western countries only after he had prematurely died.